Tyler Hardy has been a steady rebounder, strong defender and complementary offensive player for the Kingsway High School basketball team. He was much more than that in the Dragons' most important division game of season. Hardy, a 6-foot-5 senior forward, scored a career-high 19 points as Kingsway beat host Williamstown in a key Tri-County Conference Royal Division clash on Tuesday night. Senior Jamir Patterson added 18 points and senior Kevin Zehner and sophomore Alex Odom played strong floor games as Kingsway (11-7 overall, 8-1 in the division) took a two-game lead in the Royal race with three games to play. "Huge," Kingsway coach Marcus Robinson said of Hardy's performance. "We need a game like this from him. He has it in him. He has emotion in him. He just doesn't always play with it." Hardy was 8-for-11 from the field and 3-for-3 from the foul line. He also grabbed eight rebounds as the Dragons controlled the paint, scoring most of their points on layups and put-backs. "This is a big deal," Hardy said. "We want to add another year to the banner (listing division championships)." Senior guard Omar Ramos scored 22 for Williamstown (12-6, 6-3). Ramos made six three-pointers, moving Robinson to switch Kingsway into a box-and-one defense, with Odom shadowing the sharpshooting Braves guard. "I said, 'That's enough of that,'" Robinson said of Ramos' accuracy from deep. "He (Odom) is my stopper. He's a football guy. He gives us so much." Williamstown coach Grant Sporny said his team failed to take advantage of Kingsway shading its defense toward Ramos. "Omar brought the energy, intensity, everything he had," Sporny said. "But we needed other guys to step up." Kingsway scored on numerous run-outs, with Patterson in particular beating the Braves down the court for layups. Kingsway had lost two in a row and three of four. "Breaking out of the slump is huge," Robinson said. "We weren't playing our style . . . Fast-paced, in-your-face, switching defenses." 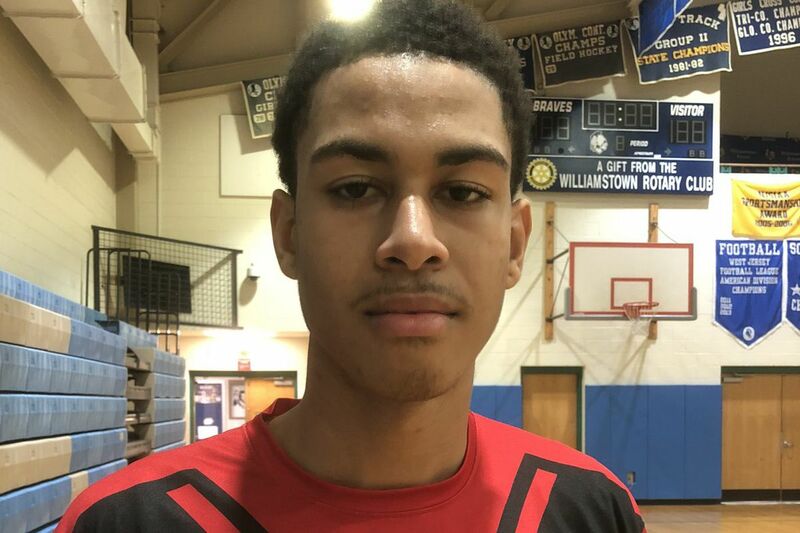 Hardy scored nine in the fourth quarter, as Kingsway held off Williamstown's last rally and pulled away in the final two minutes. "I was feeling it, and my teammates were finding me," Hardy said. The victory puts the Dragons into prime position to claim sole possession of the division title. Last season, the Dragons shared the crown with Highland. "We don't want to share this year," Hardy said. The teams are likely to meet again in the first round of the South Jersey Group 5 playoffs, as Williamstown is projected as the No. 8 seed and Kingsway as the No. 9. "We're going to see them again," Hardy said. "We're going to have to be prepared." K: Jamir Patterson 18, Jaelin Keels 10, Tyler Hardy 19, Christian Ho 6, Kevin Zehner 4, Shawn Warren 2. W: Omar Ramos 22, Nick Kenton 6, Aaron Lewis 2, Diondre Hall 5, Nick Sambour 4, Nick Roback 6.